Anyone can throw a hyzer. In fact, even for most beginners throwing a hyzer is as natural and involuntary as breathing. But getting the disc to not hyzer is like trying not to breathe. Those who are highly skilled at making a golf disc turn in the direction opposite to its natural fade all know the ability is as much art as science. As much feel and touch as proper technique. But solve that puzzle, and you’ve just taken a giant leap in your evolution as a player. There are two things that separate players who have truly mastered the flight of a golf disc and those who have not: the ability to throw a disc relatively straight for more than 150 feet, and the ability throw what is alternately known as an anhzyser or turnover shot. The two are actually connected as they both require the ability to iron out the muscle memory nearly everyone has that causes us to automatically throw golf discs on a hyzer angle. Figuring out the latter usually leads to rapid improvement with the former – another reason why understanding and mastering the multiple components of a turnover shot will take your game up several notches. However, as explained below, teaching someone to throw turnover shots is more about explaining these different components and how they relate to one another than a simple ‘Step 1, Step 2, Step 3’ approach. First let’s discuss the distinction between ‘turning the disc over’ and throwing an anhyzer shot. In a nutshell, to turn the disc over means to get it to curve in the direction opposite of that which in naturally wants to curve (fade). For instance, a right handed backhand shot will naturally fade left (immediately or eventually, depending on the disc), so a player wanting to get the disc to curve right needs to ‘turn it over’. Throwing an anhyzer is simply one of several ways to turn your disc over, all of which we’ll examine in detail. No less than six primary factors affect to what degree your disc will (or will not) turn over: angle of release, release point, trajectory, the amount of spin on the disc, the wind, and of course the stability of the disc itself. Each of these can be manipulated or in the case of the wind, leveraged to create a desired flight path. More exciting still they can be mixed together to create every conceivable shot. This photo demonstrates two of the six elements that can be adjusted to craft the exact turnover shot required: release point and disc angle. A perfect analogy is the way the three primary colors – red, blue, and yellow – can be combined to create every other color imaginable. Now consider that you’re equipped with six factors that enable you to paint a masterpiece on every throw! It’s one of the reasons disc golf just gets better and better as you improve. Disc flight can also be compared to cooking in much the same way. Great dishes can be created from just a few simple ingredients. Let’s briefly examine each factor, then explore different ways to cook up some tasty, gourmet turnovers. The angle of release refers to the angle of the nose of the disc as it’s release. It’s the most obvious of all the factors to someone first trying to learn how to throw a turnover shot since it’s fairly logical that if angling the disc to one side results in a hyzer in one direction, then reversing the angle should help it turn in the other direction. Angle of release is the most important factor in throwing an anhyzer shot, which is reversing the angle to get the disc, from the time it leaves the hand, to turn the opposite direction of a hyzer. Hmmm. . . ANgle opposite of a HYZER. Anhyzer . . . if nothing else that’s a good way to remember the correct definition of the word. And remember that anhyzering (might as well go all the way and turn it into a verb, too) is just one of several techniques for getting a disc to turn over. 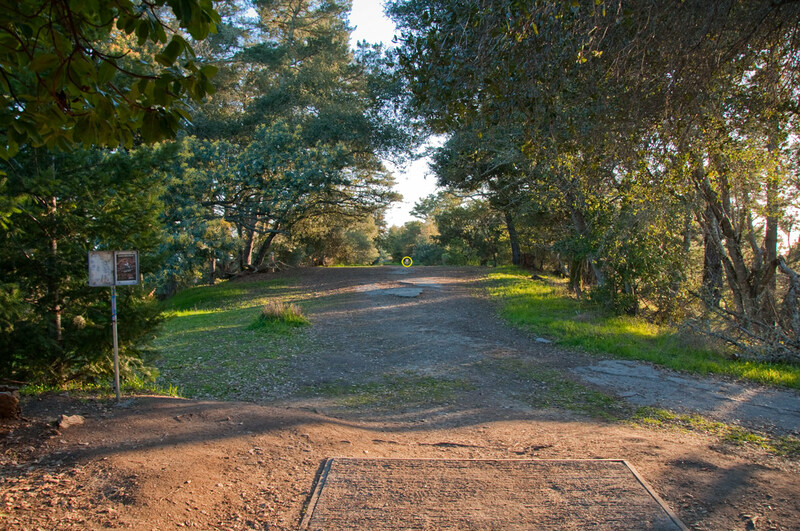 Hole 10 at Pinto Lake CDGC has OB along both sides of the fairway. The player pictured intends to release an overstable O-Lace on a sharp anyhyzer line aimed at the right side so it will turn over toward the basket then straighten out as it finishes. Note the angle of the disc as the player is just about to launch his drive. Release point is pretty much what it sounds like- the point at which the disc is released. Most anhyzers should be released at a point higher than normal, especially those intended to continue on the anhyzer line for all or most of its flight. This is because a disc that is turning over isn’t gliding through the air. It’s falling as soon as it reaches its apex, therefore it needs to gets launched from a high release point and have a trajectory that takes the disc upward, so when it begins to fall, it has more time before it comes back to earth. Which brings us to trajectory. While angle of release is determined by the angle of the nose of the disc when it’s released, trajectory is controlled by the line on which the disc is pulled back and released. When a disc is pulled back and throw on a line parallel to the ground, the trajectory should be relatively flat. 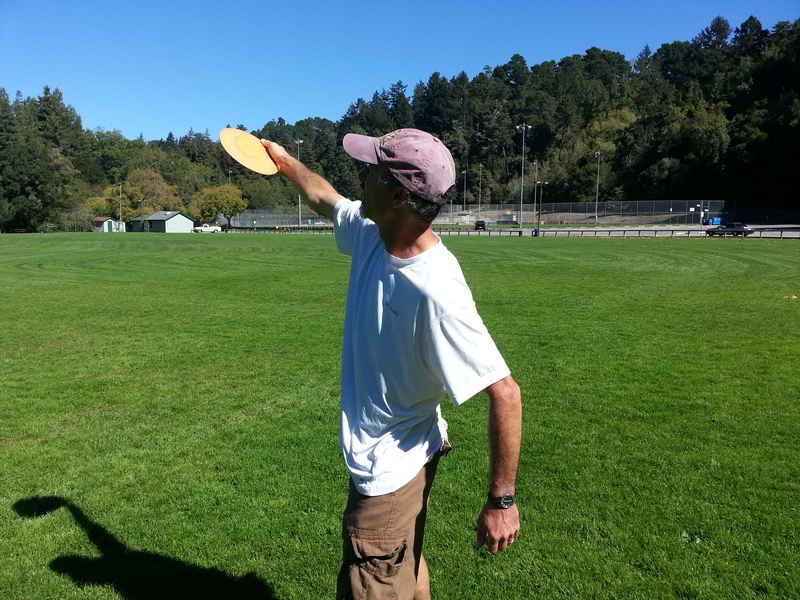 If the trajectory is angled upward, that is of course the direction the disc will go. Trajectory is especially important when throwing turnover shots – and it almost always needs to be from low-to-high – since turnover shots need time to develop, and adding height is the simplest way to get it. Most turnover shots intended to travel any distance require an upward trajectory, providing the height necessary to let the shot develop. More than any of the other factors, the proper use of controlled spin to help a disc turn over is the mark of an expert. The stability of a disc is partially determined by how much spin it can handle before it’s natural fade is overcome. Throwing a disc hard and fast like you’d try to do when attempting a long drive is one way to generate lots of spin, but not every shot calls for 100 percent power. A really good player can increase the spin on a disc to manipulate its flight path without overdoing the power. Spin, combined with angle of release, is also the key to achieving a flight where the disc flies straight or even fades for a distance before turning over. Have you heard of the term hyzer flip? It’s basically the shot I’m describing, but thrown full power. The disc is thrown on a hyzer line but at a certain point the spin is too much for the disc, resulting in turnover. With the right combination of angle, spin (and in this case raw power) and trajectory, the resulting flight path can be one where the disc begins on a hyzer line, then turns over for a period, and when the spin reduces again, ends up fading back into the hyzer line. Three turns on one throw- pretty cool. But not as cool, in my opinion, as a shot that uses spin in a more subtle way to turn a disc over. This requires increasing spin without also cranking up the power, which is a skill that for most takes a while to refine. You likely have heard or figured out that throwing into a headwind will turn a disc over/make a disc less stable, while a tailwind does the opposite. Very true. Wind is the one factor the player doesn’t control, but it has a big impact on the flight of a disc. When the wind is extreme, it’s the starting point for selecting a disc and flight strategy. When it’s more gentle, the wind is simply a fact that needs to be accounted for. Or more accurately, adjusted for. Depending on the wind, you might increase or decrease spin, throw with slightly more anhyzer angle, or (especially in the case of a good tailwind) make sure the trajectory is angled more sharply upward. Factoring wind into you turnover recipe is a good example of how subtle adjustments and combinations of factors need to be to get just the shot you want. All other factors being the same, a shot thrown into a four-mile headwind will fly quite differently than a two mile crosswind. Remember that the next time you cry out to the heavens “That disc always turns over on this hole! Why did it fade out this time?! !” Which brings us to the final factor: the disc. Back when I started playing a couple decades ago, the best advice I heard from the best players was this simple nugget: Pick a good all-purpose disc (back then that meant a Roc) and play with just that disc. Master that disc before throwing anything else. The wisdom there is that by learning with only that one disc, the player has no choice but to coax every shot out of that disc. I think that is still one of the best pieces of advice for new players because otherwise, players assume that pulling off technical shots or getting more distance is just a matter of finding the right disc for the job. Not true! Think of it this way: In any pursuit imaginable, an expert with remedial equipment will still achieve expert results. A virtuoso violinist will produce incredible music with a beat up rental violin. But give a Stradivarius to a beginner, and it will emit the same hideous squawks as he makes with his inferior instrument. I digress here for a good reason. Disc type and stability is indeed one of the six factors affecting a disc’s flight, but it has more in common with the wind than it does the other four factors. Once the disc is in your hand, you still need to know how to tune the dials of the other factors (and have the skill to do so) to get the flight you want. Like the wind, the disc, once selected, is an absolute that needs to be figured into the equation. All that being said, the finest ingredients and the best equipment in the hands of an expert do make a big difference. An understable putter can be used for some amazing touch shots that turn at just the right time, then float to the target as softly as a feather. An overstable driver can be throw with full power on a sharp anhyzer angle and just the right trajectory to produce a dramatic S-turn that passes to the left of one grove of trees then the right of another on the way to a drop-in birdie. But a player is always better off possessing one disc and mastery of flight control than a bag stuffed with any 25 discs you care to name and only vague ideas of how to use them. Watch for the next post soon in which the specific ingredients and techniques for several basic turnover shots will be discussed. In the meantime, go out to a field (if your weather permits) and experiment with the components that make up every turnover shot. See which ones work best for you. Try them with all your discs and discover the infinite ways one can make a disc fly. Playing Disc Golf like a Machine. A well-oiled machine. If I tell you to play disc golf like a well-oiled machine, and leave it at that, it would be no more useful than saying ‘It’s beneficial to execute all your shots on a consistent basis’. Thanks a bunch, Captain Obvious! Thankfully, for the purposes of this post I’ve come up with something a little better than that. My goal is to use the term in a different way in hopes that a couple concepts stick in your brain like a spike hyzer landing in soft, wet grass. (Slight digression- feel free to skim past) Experience has shown me that being an effective disc golf instructor has two distinct components. First of all, of course, the techniques and concepts I communicate need to be valid and hopefully sometimes new and insightful. But equally important is the communication itself. Excelling at a sport is no guarantee that a person will be any good at teaching that sport to others, even if that person has a good understanding of why he or she excels. If you can’t explain it to others in a way they can understand and internalize, you won’t have much success as a teacher. Part of this is a basic ability to communicate clearly- having a good vocabulary that can be adapted to a variety of different audiences. And then there is the careful selection and use of well-known (or sometimes original) metaphors, similes and sayings that will resonate and penetrate people’s long-term memory. Like a spike hyzer (or the use of the imagery of a spike hyzer, for all you literary buffs). And now on with the actual concepts I want to share- of which there are actually two. The title of this post (Playing Disc Golf like a Machine-A well-oiled machine) offers a hint to the fact that the whole ‘well-oiled machine’ phrase can actually be co-opted to convey two distinct disc golf tips. We’ll first just tackle the idea of playing disc golf like a machine. The idea here is not so much playing like a machine as it is focusing only on the shot you’re about to attempt in an automaton-like way. In other words, once you’ve decided what to do think only about the mechanics of your throw, not what’s at stake, or what might happen if you miss. In ball golf they refer to these thoughts about mechanics as ‘swing thoughts’ – the specific keys to proper form that you’ve found give you good results. For instance, when driving backhand remembering to rotate hips and shoulders, or when throwing sidearm to keep the wrist from turning over. 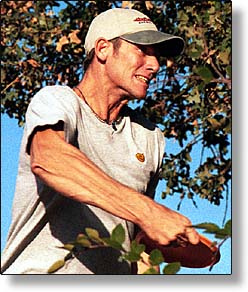 Ken Climo is the closest thing to a machine the sport of Disc Golf has ever seen. His unparalleled resume is matched only by his ability to focus only on the shot before him. Another way to explain it is to use the stereotype of the science fiction robot. Superior intelligence untainted by emotions. I know some players think they can elevate their games by getting pumped up, or mad at themselves, but in golf this is rarely the case. For every time that guy runs off a string of good holes after throwing a fit over a missed putt, there are four or five times when his tantrum has the opposite effect. Every machine is designed to perform a particular function, and that function is all it knows. We are not machines, of course, but our best and most consistent performance is realized when we can emulate them as closely as possible. 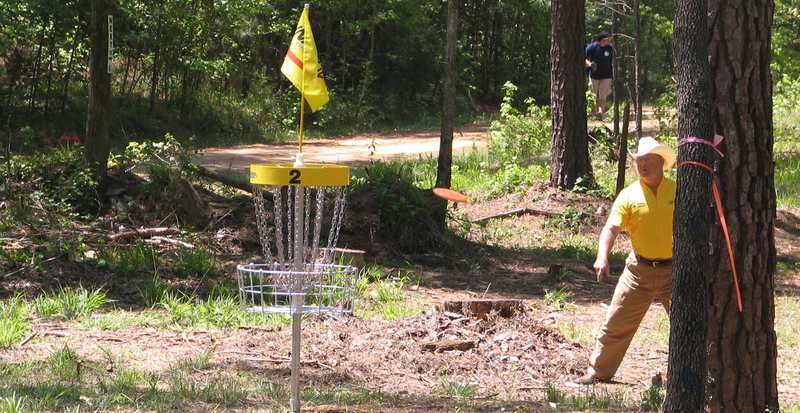 Our thoughts during a round should always be related to performing the functions of a disc golf machine- specifically the next task in the queue: the next shot. Since we’re not robots but complicated tangles of among other things hopes, fears, anxieties and excitements, we’ve no chance at succeeding at this 100 percent of the time. But being aware of when our thoughts stray outside that little box and shoving them back inside is the next best thing. Getting back to the robot analogy, it occurs to me that when we talk of machines being able to think for themselves the term used is ‘artificial intelligence’. For the purposes of being a disc golf machine, then, staying locked onto our sole purpose of executing the next shot would show the opposite of that- or real intelligence. Right? Now that the ‘play like a machine’ concept is established, let’s examine the ‘well-oiled’ part. No, I’m not talking about the use of sunscreen, although that’s always prudent. And I’m definitely not referring to being ‘lubricated’ by pumping alcohol in the bloodstream. This bit of common wisdom (which is applicable to all active sports that require fine motor skills) is an important caveat to the discussion above. Yes, by all means, play like a machine. But while focusing on those mechanics, make sure your form isn’t too mechanical. KnowwhatImean? Terms like ‘smooth’, ‘fluid’, ‘loose’ and even ‘relaxed’ are all used in relation to this concept. Smooth as opposed to hurky-jerky. Loose rather than tight. Relaxed instead of anxious and nervous. And fluid, well, fluid more than the others is directly analogous to the imagery of a well-oiled machine. Picture water flowing downhill and conforming to the terrain, compared to rocks tumbling down that same hill. Smooth follow-through and good balance are good indicators that you’re playing like a well-oiled machine. One final example would be the most obvious- the way motor oil keeps the piston in your car’s engine firing smoothly, rather than seizing up and causing you to . . . shank your drive! That’s my subtle way to bring the discussion back to disc golf. So how do you make sure you play like a machine on one hand, but also stay loose, relaxed and fluid on the other? Well, first of all keep in mind that ‘play like a machine’ refers mostly to your mindset and ability to focus only on the things that enable to properly execute the shot, while the ‘well-oiled’ reference is a reminder to stay loose and relaxed at all times. They’re really two separate bits of advice that go together in a yin/yang kind of way. When your mind gets too cluttered with all the things that go into good shot planning and execution (not to mention all the extraneous stuff a ‘machine’ would never factor in), it can create tension in your body in a very surreptitious kind of way. You might not feel it until it’s too late. Therefore preventative measures are often in order. Maybe you just perform a little last-second checkup to see if you’re feeling tight or loose- or just assume that a certain amount of tightness will always creep in and takes steps to prevent it. Ever see someone take a deep breath before every putt? Sure you have! That’s exactly what they’re doing. Flushing out the tension and letting the natural fluidity flow back in. So there you have it. Play disc golf like a machine programmed for that singular purpose, eliminating everything else from your thought process. But don’t let that turn you into a Wizard of Oz Tin Man in need of an oil can. Loosen up and have fun! More specifically, today was a very good disc golf day in the life of a player whose days of high-level competition are mostly behind him. At the risk of boring those who could care less about the disc golf exploits of others I will recount my round today, because it gives me the opportunity of sharing yet another lesson on one the sport’s finer points. Specifically, we’ll examine what I think is the appropriate way to act when someone in your group is having a potentially personal-best, or-for-some-other-reason historical round. A little backdrop: I had been camping with the family and hadn’t played DeLaveaga for almost a week. In that time, the baskets had been moved (some of them at least) for the first time in a couple months. Ten of the 29 baskets were in different spots than the last 20 or so rounds I’d played there. My friend Asaf and I met for a casual round this afternoon, and for the sake of brevity I will tell you that he shot a +10, which is a little worse than his average and significantly above his recent scores of between +2 and +6. The round started off for innocuously enough for me with a par on hole 1 (basket in the A position). But I did feel an energy, or strength, on the drive, and it gave me confidence to play Hole 2 aggressively. Hole 2 at DeLa is uphill and also a fairly sharp left dogleg with plenty of trees. As a left-hander it requires a technically near-perfect S-turn drive with premium power. I felt as I released it that as long as it didn’t roll away it would be good, and it was. Close enough to putt with the Ape driver that did the heavy lifting. Birdie number one on the day. Hole 3 provided the first opportunity for a big putt. I pulled the drive left, leaving a 50-foot jump/straddle blocked by low limbs. Dead center, -2 after three holes. This 50-footer from an obstructed lie on hole 3 slammed dead-center into the chains. 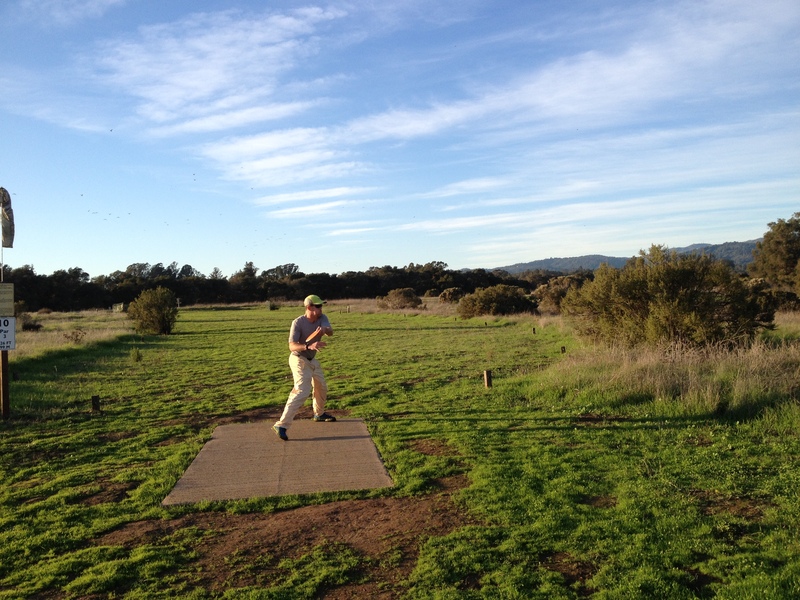 After a par on hole 4 in the short position (one of the new pin positions), I birdied 5, 6, 7, and 8 (the final of these while playing through a group from the Bay Area Chain Smokers clan- one of whom helped me out big-time in a School of Disc Golf event recently. Thanks Ryon!). Holes 5 and 6 required short ‘tester’ putts, while both 7 and 8 were in the 25-30 range. At this point I was -6 after eight holes and it was hard to ignore the fact that I was off to a rather hot start. It’s worth noting two things at this point: First of all, I try very hard to NOT keep track of my total score during my round. This has been well-documented in previous posts, so feel free to do a little research to understand why I am so passionate about this philosophy. Second, my friend Asaf was also well aware of my hot start, as he later revealed- yet he took pains even at this point to NOT comment on that fact. He is quite familiar with my efforts to not dwell on cumulative score during a round. Holes 8A through 14 (six holes total) were all pars, but even that attests to the magic of this round. 8A and 10 were both missed birdie opportunities for me, but 9, 11, 12, and 13 are all holes on which I average more than par. Hole 9 is a tough lefty hole, but I played it safe. Hole 11 in the long-left position is tough for anyone, and for me today it required a tough, technical, lefty backhand skip-upshot with a Star Tern to save par. Hole 12 had just been moved to the long ‘Wind-chimes’ position, and I didn’t have the disc I would normally drive that hole with, an OOP, pre-Barry Schultz gummy Beast. I threw the Tern instead and hit the small gap left of the canyon to net a par. Then I came to Hole 13. I-5. 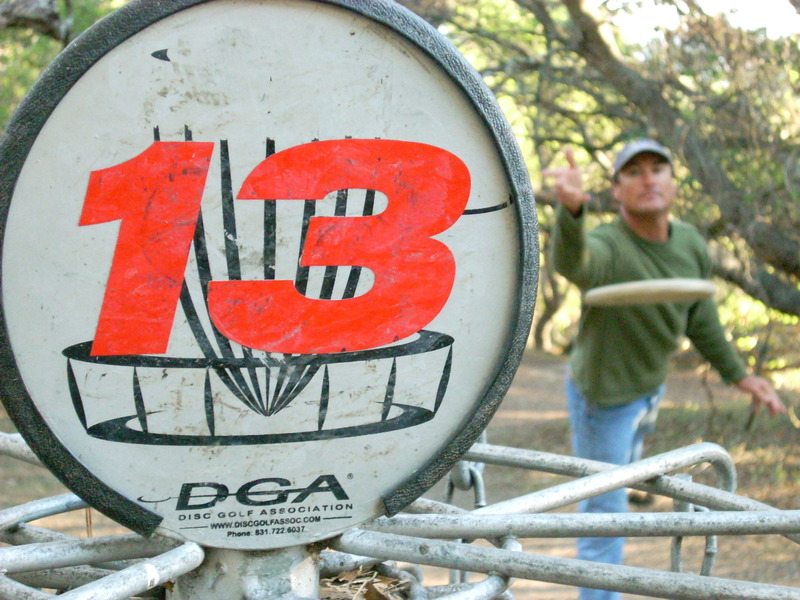 DeLaveaga was installed in the early 1980’s, a time when all disc golf holes were for the sake of consistency par 3. If DeLa were installed new today, hole 13 would today definitely be rated a par 4, but it is and now always will be par 3. For this reason, it is impossible to approach this hole bogey-free and not think about the significance of getting a par 3 here. It’s easily the toughest hole on the course in terms of par, so if you make it past 14 bogey-free, in theory the toughest obstacle has been conquered. Never mind the fact that there are 15 holes yet to go. 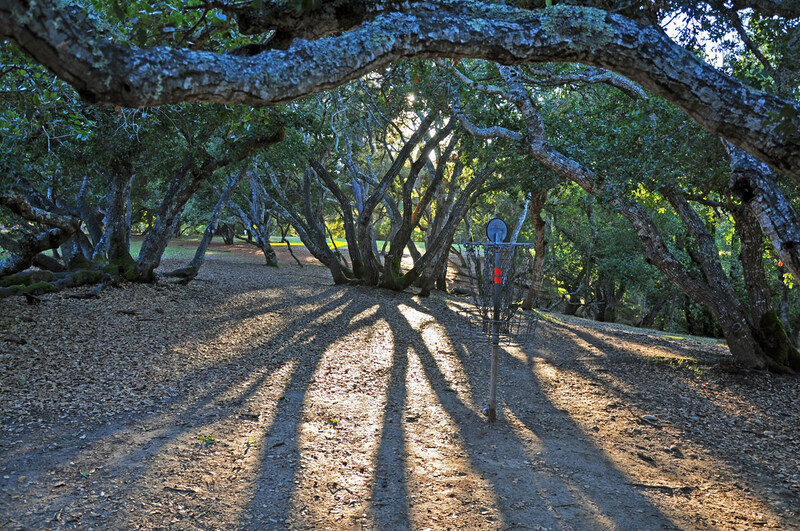 The view of this picture of Hole 13 at DeLaveaga is from behind the basket looking back to the fairway. Obviously the epitome of a guarded green. Add 500-plus feet of distance and this is one tough par 3. Photo by John Hernlund. My drive on 13 was as usual a backhand lefty roller, and it was a good one. I got all the way through the flat, wide-open first half of the fairway before my roller began to turn over toward the steep, wooded canyon on the left. That’s important, because if it makes it far enough before cutting left there is usually at least a chance to eek out a par through the trees. Such was the case today, and my pinpoint upshot with my (secret weapon) soft Vibram Ridge gave me a 23-foot par putt which I was able to hit, keeping my unblemished round intact. If Asaf made any notable comment or compliment after I hit that putt, I don’t recall it. He likely said something like ‘nice putt’, but I just don’t remember. That’s a pretty big deal in itself, because I’ve actually had people say to me when I was bogey free after hole 13, “Did you know you don’t have any bogies yet?” Now, I’m not truly superstitious, but jinxes aside, there are things that common sense should tell you not to say in certain circumstances. The last thing I want to hear from another player in a spot like that is a verbal reminder that I’m bogey-free. To reiterate, a bogey-free round at DeLa is a big deal. Almost as rare for a player of any level as a no-hitter in baseball- which brings up another good analogy. 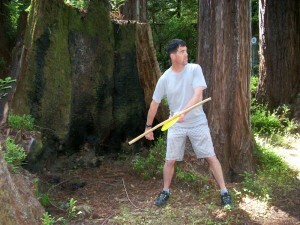 Before getting hooked on disc golf in the mid 90’s, I was (like Paul McBeth) an aspiring baseball player. And as all baseball players know, there are a numerous time-honored traditions. One involves how teammates treat a pitcher who is in the process of potentially recording a no-hitter. In baseball, as the outs and innings tick by, the pitcher’s teammates work harder and harder to avoid him. By the eighth and ninth innings no one will even sit near him in the dugout- much less engage him in conversation. Asaf has never played baseball, but he has impeccable golf etiquette, and his instincts on how to react to my hot round were spot-on. As I said, my par putt on 13 drew a perfectly measured response from Asaf. Hearty congrats for parring a hole that seeing may more 4’s than 3’s, but nothing to draw attention to the fact that I just cleared the biggest hurdle to carding a bogey-free round at DeLa. Hole 14 was in the 2nd-toughest of it’s four possible pin placements, and after a drive good enough to get a pretty routine upshot for par, I kinda blew it. I hit a high limb trying for a high hyzer upshot and left myself 29 feet away. Feeling for the first time the full pressure of bogey-free potential, I hit the putt to keep hope alive. Asaf once again didn’t betray his recognition of the significance. I uncharacteristically celebrated, but I don’t recall him saying much of anything. I mentioned earlier that I’d had only four bogey-free rounds at DeLa in more than 20 years . . . well, I’ve made it past hole 13 only to get my first bogey on 14 at least 10 times. So that was a hurdle to clear as well. Hole 15 was my first birdie in seven holes, hole 16 saw one of my longest drives there ever (400-plus feet in the air, but I missed the 40-foot putt), and hole 17 resulted in a birdie for both Asaf and me. Hole 18 and 19 were both pars for me, but Asaf birdied 18 so he took the teepad for the first time. I remember kind of liking that as it took the focus off me and my round. On hole 20, which had just been moved to its right position, I likely came close to an ace. We couldn’t see the result from the tee, but my drive ended up just past the hole, 18 feet away. I birdied that hole, as well as 21 and 22, a long drive across an OB road- which I based. Holes 23 and 24 were pars, which left me with what we refer to at DeLa as ‘The Hill,’ the final four holes that play up, across, and down a steep, rutted, and tree-filled slope. Hole 26a at DeLaveaga looks simple enough from the tee, but a narrow fairway and steep drop-offs on both the left and right mean drives need to be both very straight and fairly long. Photo by John Hernlund. Hole 25 was recently moved short, which is a good thing, except that the short pin placement is close to an OB road to the right. For a guy throwing lefty backhand hyzer, at that position for the first time in months, it caused a good deal of consternation. 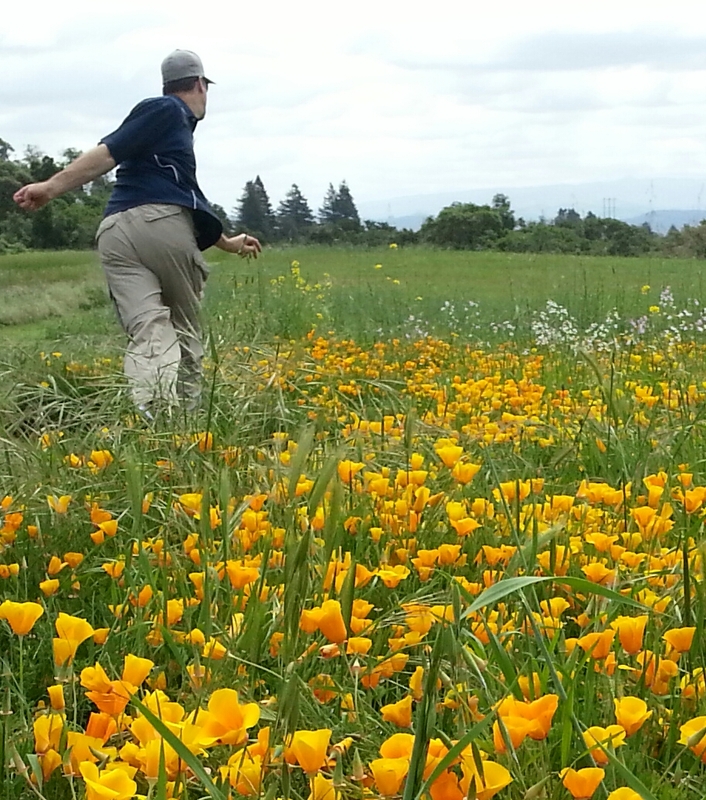 My Vibram O-Lace came through, though, and the reliable grip enabled me to turn a big S-turn into a drop-in birdie. Asaf, in retrospect, was treating me more and more like radioactive material. Hole 26 in the long is one of those holes where it’s nearly impossible to just ‘play it safe’ off the tee. I did what I normally do, got a good result, layed up as safely as possible for par (if you know this hole you know that there is no such thing as a routine par here) and thankfully kept my card clean for another hole. 27 holes down, two to go. Hole 26a was added around 10 years ago – maybe longer – at a time when we were trying to ‘rest’ some environmentally sensitive holes like 17. The idea was to always have 27 available to play. It sits on a narrow ridge between the basket for 26 and the tee for 27, with steep DeLa-style drop-offs on both the left and right sides. 26a was one of the holes just moved- to it’s long position. I knew if would provide the final challenge to a bogey-free round, as hole 27 (normally Top of the World) to an ridiculously short position. My drive on 26a, thrown with a Legacy Rival for stability and control, came out exactly as I wanted. However, at the end of its flight it got caught by some Scotch Broom foliage in the fairway and left me with an obstructed 200-foot upshot. I did everything I could with my soft Ridge given the circumstances, and it came down to a 40-foot low ceiling look for par. My lean/jump-putt looked good most of the way, then hit the top nubs of the Mach X basket and fell unceremoniously to the ground. Bogey. What happened next, though, was pretty cool. It was obvious that Asaf had been for many holes holding in the desire to show his support for my effort. We discussed what had been moments before taboo, then quickly moved to the fact that he could preserve a single-digit score by parring the final hole. I was disappointed to lose the bogey-free round on the second-to-last hole, but also still aware that I had a pretty hot round going anyway. After my teeshot on 27 looked like another likely birdie putt and we were snaking out way down the 68 steps from tee to fairway, I mentioned that I thought I still might have a shot a double-digits under par. Asaf replied that he thought I was easily at that mark, but I wasn’t sure. As I mentioned earlier, I try hard not to keep track of my total, and if I had to guess at that time, I would have guessed that I was either -9 or -10 at that point. Turns out I was -12 when I missed my par putt on 26a, and then -12 after I hit my 13th and final birdie on 27. I tied my personal best (recorded in 2006), didn’t get the bogey-free round that really meant more to me, but still floated around the rest of the day basking in the glow. The best and most lasting memory, though, will be of my conversation with Asaf afterward. He said that he was so aware of my round, from the hot start to the par on 13 and on, that he didn’t want to do anything to mess it up. He said it got to the point, on the last six or seven holes, that he didn’t even want to touch my discs. I hadn’t noticed that, but appreciated it with a chuckle after the fact. As an old baseball player – an old pitcher, in fact – I could not have not asked for anything more in a playing partner. So the specific advice is this: when you’re playing with someone who has a hot round in the works, do like Asaf and refrain from any commentary that draws attention to the hotness of the round. If the player brings it up then you’re in the clear. But don’t be the one to raise the topic. In fact, generally speaking, you can never go wrong by limiting your narrative on other peoples’ shots (and your own for that matter). Let the game for the most part speak for itself, and use the time together to discuss other things. All things disc golf. Dot com. We seek to reach the largest audience possible, and to that end have in the past also published posts at RattlingChains.com. The partnership has worked well for both sites, but in keeping with our mission statement (‘inform as many people as possible about the numerous benefits of disc golf’), we’ve decided that change is in order. We thank RattlingChains for a great run together and wish them nothing but the best in the future. Moving forward, School of Disc Golf posts will appear at the rapidly expanding All Things Disc Golf. This site is the undisputed leading disc golf blog in terms of page views and unique visitors, and until now its content has consisted mainly of product reviews and Q&A interviews. The new affiliation of School of Disc Golf is only one facet of All Things Disc Golf’s expansion that will add instructional content, feature stories, increased tournament coverage, and contributions from several talented graphic artists. You can read the detailed announcement here. We’re excited to be part of a larger effort to reach the masses with the great story that is disc golf, and as always School of Disc Golf will continue to also focus on helping those who already love the sport improve their skills, scores and enjoyment.